Boil 2 cups of water in medium-sized pot. When water is boiling, add quinoa and lower heat. Simmer for 10-15 minutes until quinoa is done. Fluff with a fork and set aside. While quinoa is cooking, in a large pot, boil 4 cups of water. Add cubed potatoes when water is boiling. Boil potatoes for 10-15 minutes until done. Strain and set aside. In a large bowl, combine quinoa and potatoes. Let cool. In a food processor or blender, add all pesto ingredients. Pulse until it forms a chunky but somewhat smooth consistency. You may need to add water, continue to add water until you achieve the desired consistency. 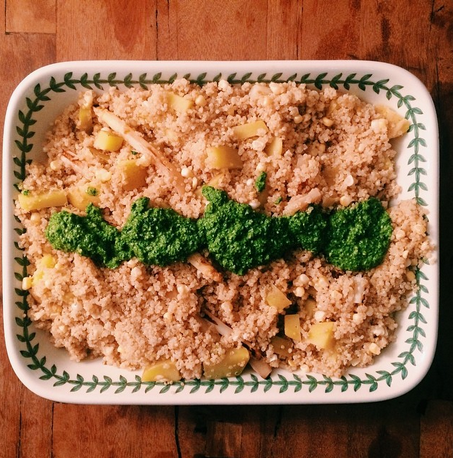 Serve quinoa with pesto arranged in a narrow row on top. Enjoy!